Congressman Flores answers a question about the two versions of the tax plan. Congressman Flores answers a question about the tax plan and the deficit. 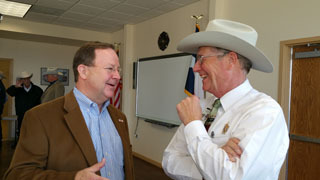 Congressman Bill Flores held this Access Live Video Event to give constituents an opportunity to discuss various issues being debated in Congress. Among the topics discussed were the tax plan, immigration and health insurance.